Questions about public access to and public ownership of the coast and beaches came into sharp focus in the early 2000s with the case that northern South Island Māori brought in the Māori Land Court to determine whether the Marlborough Sounds foreshore and seabed were Māori customary land. What are the foreshore and seabed? the foreshore is the land that is regularly covered by the tide (the wet part of the beach). It includes land covered by high tides in spring, the space occupied by the air and water above the land, and the soil and rock under it. English common or customary law was brought to New Zealand with the Treaty of Waitangi in 1840. It stated that the Crown (the government in New Zealand) was the owner of the coastal water, foreshore and riverbeds. As owner, the Crown granted parts of the foreshore and seabed to other people. The new owners still had to let the public fish or use boats on their coast. For a long time, Māori had used land under the water for bringing in canoes, recreation, fishing, battles, burials, and collecting seaweed. The Crown’s assumed ownership overlooked these Māori activities. From 1840 the Crown did not always recognise Māori use of the foreshore and seabed. New Zealanders have traditionally believed they had the right of access to rivers, streams and beaches. But the law did not say that they had this right. The Queen’s chain is a 20-metre strip above the foreshore and along the edge of coasts, rivers and streams. It is used by the public for recreation. People believed the Queen’s chain provided legal access to the foreshore from the landward side. But some parts of the coast had always been privately owned. the seabed had always been owned by the Crown. people who owned dry land next to the foreshore, and who had been using part of the foreshore and seabed since 1840, could claim territorial customary rights and apply to the Crown for redress. In 2011 the National-led government replaced the Foreshore and Seabed Act 2004 with the Marine and Coastal Area (Takutai Moana) Act 2011. 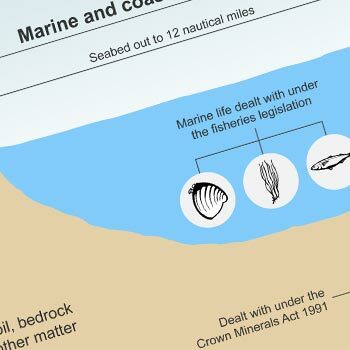 Crown ownership of the foreshore and seabed was replaced with a ‘no ownership’ regime. Under the law, iwi could apply to the court or negotiate with the Crown for recognition of customary rights (which protect activities such as collecting hāngī stones or launching waka) or customary marine title over a particular area. However, these interests could not prevent existing rights and uses such as fishing, aquaculture and public access.